Tranquil Foundry Dock Park is just a few steps from the Cold Spring train station. Photo: Robert Rodriguez, Jr. 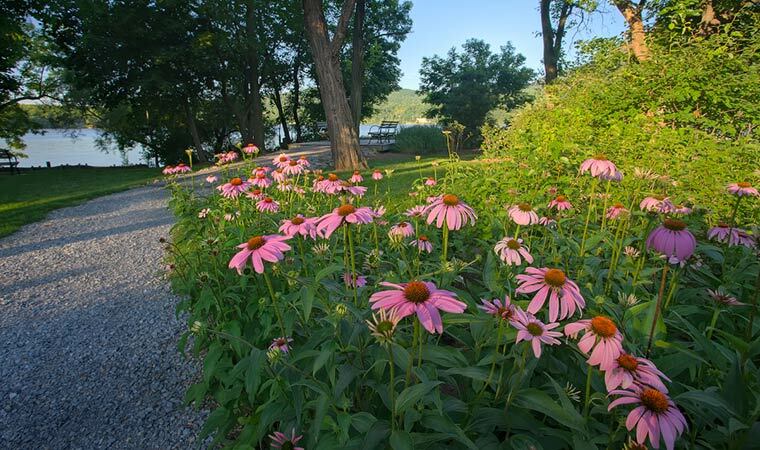 COLD SPRING, Putnam County (0.7 acre)—It's hard to believe this riverfront oasis — a perfect spot to marvel at the Hudson Highlands — was the busy loading dock of the West Point Foundry. Located just southeast of here, the foundry was established in 1818 to produce artillery for the U.S. government. During the Civil War, it manufactured Parrott guns, cannons whose accuracy is credited for the North's victory. Until its 1911 closure, the foundry also produced some of America's first locomotives, steamships and pipes for New York City's water system. Finished goods were transported by rail to a pier stretching into the river off Foundry Dock Park (you can see a portion of its remains at low tide) and then shipped worldwide. Park visitors can view a simulation of the foundry's rail line and enjoy wildlife attracted to a variety of native plants. For paddlers, this is a great place to begin excursions into Foundry Cove and Audubon New York's Constitution Marsh Sanctuary, a haven for waterfowl and migratory birds. Kayak, canoe and paddleboard rentals are available through Hudson River Expeditions, our official paddlesports concessionaire. History buffs shouldn't miss the picturesque 1833 Chapel of Our Lady next to the park, built for foundry workers. The remains of foundry buildings, located in Scenic Hudson's West Point Foundry Preserve also are a short walk away. Both Foundry Dock Park and West Point Foundry Preserve are listed on the National Register of Historic Places. A short, universally accessible walking path rings the park. A connecting trail to West Point Foundry Preserve is accessible from the northbound platform of the nearby train station. SEASONAL NOTE: Waterfowl hunting is permitted in the adjacent Foundry Cove Marsh and Constitution Marsh Audubon Sanctuary from Oct 10 - Oct. 18 and Nov. 7 - Dec 27. Visitors are asked to refrain from paddling in the marshes during those times. Year-round daily dawn to dusk. Allow a minimum of 1 hour, longer if you plan to kayak. See this page for specific rules about kayaking/canoeing in Audubon's Constitution Marsh Sanctuary.CAUTION: access to Foundry Cove Marsh and Constitution Marsh is impossible at high tide; check tide charts before setting out. NEVER cross over the railroad tracks. From intersection of Route 9 and Route 301, take Route 301 west for 2.6 miles to intersection of Route 9D at traffic light. Proceed west on Route 301/Main Street for four blocks; turn left on Lunn Terrace to end; turn left on Market Street. Park entrance on right. Free weekend parking adjacent to the train station. By train, exit Cold Spring station. *For a permit to launch a small motorized boat from Foundry Dock Park, contact the Village of Cold Spring.